After you upgrade your Dell laptop such as Vostro 3459 to Windows 10, the touchpad cannot work properly. When you touch the touch screen with your finger, the cursor has no response or disappeared. The two buttons also have no response. So the laptop touchpad lose efficacy. And sometimes after upgrading system to Windows 10, the touchpad is not recognized by Windows 10 and in device manager it shows yellow exclamation. So if your Dell touchpad does not working on Windows 10 or the touchpad is not recognized by Windows 10, you can try to use the solution of update Windows 10 touchpad driver to solve it. In some condition, maybe you think it is your touchpad function disabled by yourself. But you cannot find the option to enable touchpad in mouse settings or touchpad settings, because your touchpad settings control is missing. 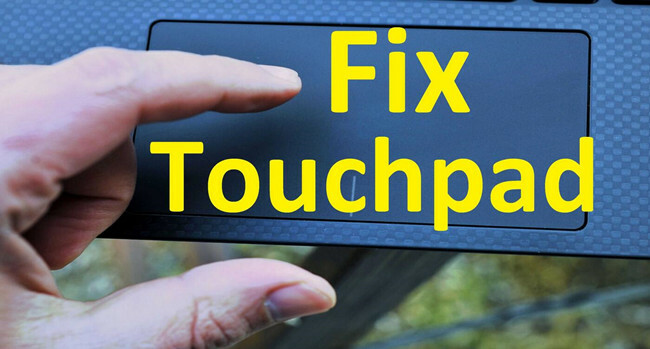 You can also through reinstall the touchpad driver to solve it. After that, you can enable and disable the touchpad arbitrary. So let’s downloading Dell touchpad driver for Windows 10 and updating it. There are two ways you can do it: manually and automatically. The manually way will be some complex and take some time. If you do not want use this way, you can try to go ahead to solution 2. Step 1: Enter Dell drivers download center. Step 2: You can type the laptop device id or choose from all products to find the laptop. 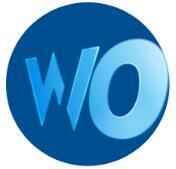 After that, you will enter the laptop manage webpage such as this is Vostro 3459 support web. Here it can diagnostic your computer, download drivers and manuals, view the support topics. Step 3: Choose Drivers & downloads tab in the left. In the right window, choose Find it myself. Of course, you can choose Guide me to automatically detect for your touchpad driver. Step 4: The webpage will automatically help you to detect your system, here is Windows 10 64 bit. If you want to download touchpad for Windows 10 32 bit, you can click Change OS to select the right system type. 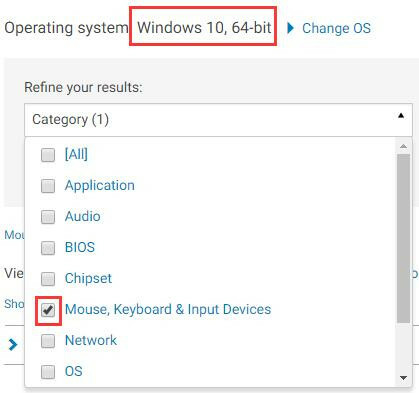 And for the touchpad downloading, you need to select Mouse, Keyboard & Input Devices option from the category drop-down list. After that, the touchpad driver will list below. Step 5: Download the latest version of Dell touchpad driver. Here you can see the touchpad driver file is Input_Driver_KXG38_WN32_19.0.15.2_A01.exe. 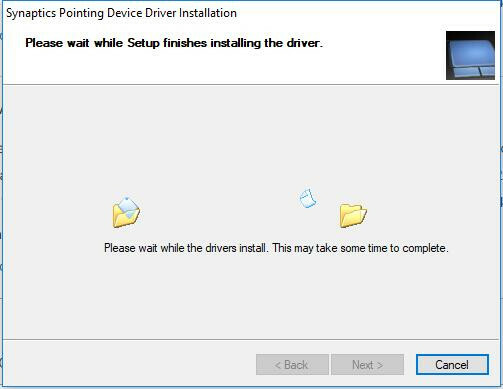 It is a Dell Synaptics pointing device driver. After the download finished, you can install it step by step. The touchpad driver is a synaptics pointing device driver. And then, restart the computer to make it work. Then you can test your touchpad if it is working or not. For downloading Windows 10 Dell touchpad driver and updating it automatically, you can use Driver Booster to help you. 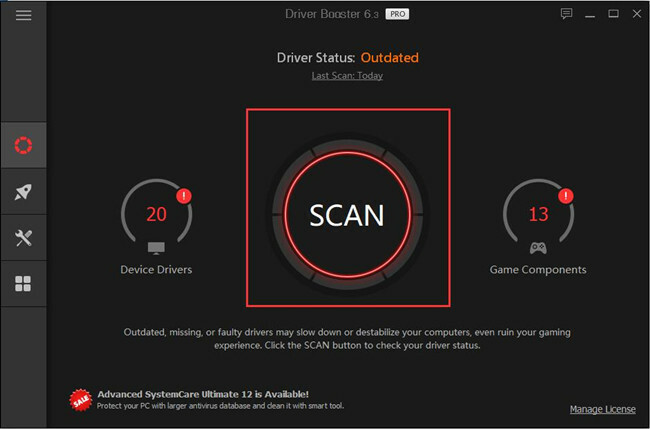 Driver Booster is a professional driver detector, downloader and updater software. As the top 1 driver update in toptenreviews, you can trust it. It scans all the interrupt, missing and outdated drivers fast. With one click, you can update all the drivers. After that, install and run it on your Dell laptop. You can follow these steps to download Dell touchpad driver: Scan > Update. After that, install the driver including Dell touchpad device, then restart computer. This way will be easier because only need 2 clicks your Dell touchpad driver will up-to-date. After you updated the Dell touchpad driver for Windows 10, the touchpad icon will appear in the taskbar. So you can use it to set the touchpad enable or disable. Many people may not know how to disable or enable the Dell touchpad, such as the Dell Vostro 3459. The Fn + F12 shortcuts will not work to disable the touchpad. So you need to use the Dell pointing devices to control it. If you cannot find the Dell touchpad pointing devices, you should use solution 1 and solution 2 to update the touchpad driver. Step 1: Right-click the touchpad icon, and choose Touchpad Properties. 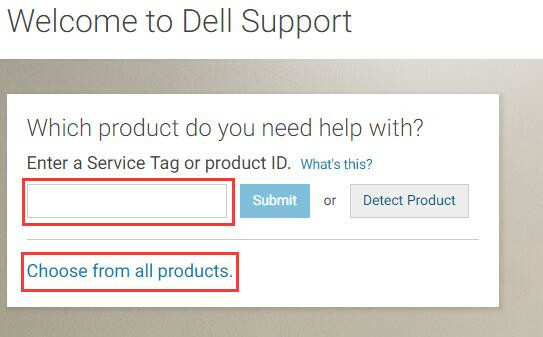 This will help you to enter the Dell Pointing Devices settings. 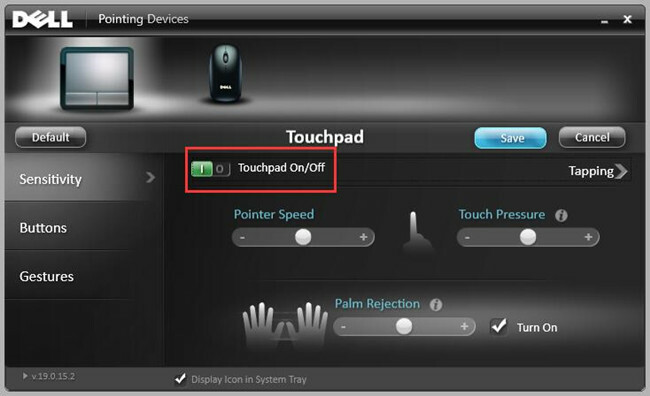 Step 2: Click the Touchpad On status to open the Touchpad function. After that, you can use the TouchPad as the mouse. Of course, you can click Touchpad Off to disable Dell touchpad function. So you will not get in touch with it when you use the built-in keyboard to type something. My Dell E6410 touchpad stopped working. Windows 10. USB mouse was fine. Little button between the G and H keys worked too. No touchpad. I uninstalled and reinstalled the driver, and the pad itself. Nothing. No function keys would turn it on either. Tried to Restore back a week, but my computer couldn’t find the file. The real question I had was, software or hardware? So I created a Linux boot DVD. Very simple, took 10 minutes to download the Linux, a few more to burn the DVD, videos online explained how to do it. I rebooted the computer in Linux. Yeah! Touchpad worked. Not a hardware problem! And when I rebooted in Windows 10, it still worked. So, try this fix. At worse, it will tell you if your hardware is broken, or your software.